UAW refuses to take Volkswagen defeat lying down - The coordinated campaign of the United Auto Workers union, Volkswagen, and the National Labor Relations Board at Volkswagen's manufacturing facility in Chattanooga, Tennessee, failed to produce the result desired by pro-union interests. But, as expected, the UAW has now filed objections based on statements of certain Tennessee politicians expressing the view (among others) that a UAW victory would turn Chattanooga into another Detroit and make other automotive manufacturers reluctant to locate in the area. Sen. Bob Corker (R-Tenn.), who recruited Volkswagen to Chattanooga, said that Volkswagen would manufacture its mid-size SUV there if the UAW was defeated. Volkswagen denied any such connection. The Union claims that the politicians' statements amounted to threats of retaliation if the Volkswagen employees voted for the union. How Volkswagen will formally respond to the objections in the NLRB proceeding is unknown. Because Volkswagen did not oppose the union, it may side with the union now, but that could create further public relations issues for Volkswagen. The politicians are expected to assert their constitutional rights of free speech even if the UAW considers the speech threatening to its interests. Obama Administration continues with pro-union policy triangle - Even before the election dust had settled in Chattanooga, Volkswagen, with union members on its parent Board of Directors in Germany, asserted that it still wants to pursue a "works council." And organized labor, with the help of the Obama Administration, will continue trying to tilt the playing field in three ways. First, as noted by Cliff Nelson in his bulletin on the VW campaign, the Specialty Healthcare "micro-bargaining-unit" decision (enforced by the U.S. Court of Appeals for the Sixth Circuit) allows unions to target a small group for an election, giving the union its best chance of success. Had the UAW targeted a narrow group of voters at VW, it might have prevailed. Second, the proposed "persuader" regulations recently issued by the U.S. Department of Labor will hinder the ability of employers to get confidential legal advice and therefore increase the likelihood that unfair labor practices will inadvertently be committed. Recent unofficial reports indicate that final regulations may be delayed because of the controversy they may generate. Finally, we have the Board's proposed rule on "quickie," "ambush," or "snap" elections. Although, as noted by Cliff, the "quickie" timetable at VW did not result in a win for the union, the rule is expected to give employers insufficient time to provide relevant information to employees before the campaign begins. The squeeze on employers and in favor of union organizing efforts created by these three actions is taking place now. Employer groups are expected to continue pursuing legislation and court challenges. Although the 2014 elections will undoubtedly have some impact, even sweeping Republican victories are unlikely to stop this Administration. And top-down corporate campaigns, aided by worker center groups that operate largely outside federal law and so-called "progressive" organizations, will continue to put additional pressure on employers who do not get in line with the union's interests. Paid "union release time" for public employees is unconstitutional, Arizona court holds - Public employee unions have grown accustomed to having taxpayers pay for union activity, including lobbying. The practice is incorporated in many state, county and municipal union contracts across the nation. For the federal government, the cost to taxpayers is conservatively estimated at $155 million a year. In what may be an important initial victory in stopping forced taxpayer support of union activity, including overt political activity, a state court in Phoenix has held that so-called "union release time" at government expense violates the gift clause of the Arizona Constitution because public monies were being diverted to private use with no corresponding public purpose or benefit in return. In the lawsuit, brought by the Goldwater Institute against the Phoenix Law Enforcement Association, a labor union, the plaintiffs alleged that Phoenix police officers engaged in recruitment and campaign activities, and lobbied against the interests of the City, while on paid union release time. So, where now? Forty-seven states' constitutions reportedly have gift clauses, and at the federal level there may be First Amendment and other legal implications. The police union in Phoenix is appealing the court's decision. 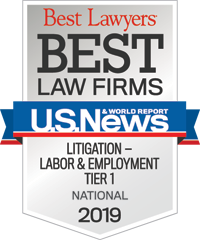 Considering a fix to a problem that does not exist, NLRB re-examines standards for deferral to arbitration awards - The NLRB has invited amicus briefs from interested parties in a case involving deferral to an arbitrator's award under a collective bargaining agreement. The Board's General Counsel seeks to have the Board narrow the grounds for deferral, which essentially gives a union or charging party "two bites at the apple." Needless to say, deferral in the decision at issue had an "employee-unfriendly" result: the employee's grievance of his discharge was denied. The General Counsel now seeks to change the standard to put the burden on the party seeking deferral, usually the employer. Under the requested standard, the party seeking deferral would also have to show that (1) the collective bargaining agreement incorporated the NLRA statutory right, or the NLRA issue was presented to the arbitrator; (2) the arbitrator correctly enunciated the applicable statutory principles and applied them; and (3) the award is not clearly repugnant to the National Labor Relations Act. The proposed standard would be a one-way street that would benefit only the union/charging party side. It is arguably intended to give the General Counsel more settlement leverage by increasing the cost of litigation for employers. This scenario arises with a backdrop of a collective bargaining agreement wherein the parties typically agree to resolve "ALL" disputes before an arbitrator. Employers should understand that, before the Board, "all" does not mean "all," despite the intent of the parties to a collective bargaining agreement. Under the existing standard, the Board will defer when (1) the arbitration proceedings are fair and regular; (2) all parties agree to be bound by an arbitration; (3) the arbitration decision is not repugnant to the purposes and policies of the NLRA; and (4) the arbitral forum considered the unfair labor practice issue, such that (a) the contractual issue under the collective bargaining agreement is factually parallel to the unfair labor practice issue and (b) the arbitrator was presented generally with facts relevant to the unfair labor practice issue. Under the current standard, the party opposing deferral bears the burden of proof. Arbitrator awards $3.8 million to Port of Baltimore employers' association, after Longshoremen's local strikes in violation of contract - Local 333 of the International Longshoremen's Association, which represents workers at the Port of Baltimore, got clobbered in late January. An arbitrator decided that the Longshoremen's violation of a no-strike provision of an East Coast Master Agreement caused damages of $3.8 million to the employer's association at the port. The award did not include damage to others who were not parties to the agreement, such as truckers, rail workers, and other employers and their employees. According to a report in the Baltimore Sun, a Maryland Port Administration official said that it was "critical to have labor harmony" at the port, and that the strike was "not good for our port's reputation." The report indicated that contract negotiations are continuing, even after a 90-day cooling-off period, and that port officials have confirmed diversions of cargo to other ports as the labor dispute causes shippers and fleet operators to seek "quieter waters" for their cargo. Meanwhile, the president of the local was quoted as saying that "union officials are looking for ways to appeal the ruling and avoid paying." A union steward in the huddle? Steelworkers-funded union seeks to represent Northwestern University football players - First we had unpaid student interns claiming to be employees. Now there is a new chapter in the "students claiming to be employees" story. On January 29, a union called the College Athletes Players Association, which receives funds from the United Steelworkers Union, filed a petition with the NLRB seeking to represent the players on Northwestern's football team. According to the Players' Association, the athletic scholarships that some players receive make them "employees" subject to NLRB jurisdiction. (Apparently non-scholarship and walk-on players are "second-class citizens," not employees). The university, based in Evanston, Illinois, has said that it views the players (appropriately named "the Wildcats") as student-athletes and not employees. An NLRB hearing on the issue was held in mid-February in Chicago, and as of the time we went to press, there had been no reports about the outcome. A ruling of "employee" status would obviously have dramatic implications for private universities and colleges, and potentially all college sports. Although state-supported colleges are not subject to NLRB jurisdiction, why would they want to schedule games with teams that might go on strike or get locked out! And what about religious institutions with "big time" sports, like Notre Dame or Southern Methodist University? The NLRB may be looking for expanded jurisdiction there, too. Over the years, the NLRB has been inconsistent in its treatment of graduate teaching assistants, who are not completely analogous to football players because the assistants are paid.